Lupus is a shape-shifting disease that can masquerade as any number of maladies. It’s a potentially life-threatening autoimmune disorder that can strike anyone, at any age, in entirely unpredictable ways. Although it is a hard condition to diagnose it is critical to catch it early. Therefore, being able to recognize the symptoms of lupus is critical. With that in mind, here are some of the essential things you need to know about lupus (including 15 early warning signs). Lupus is a disease where the body’s defenses (in the form of antibodies) end up attacking healthy tissues. At present, it’s not exactly clear why the immune system goes haywire, but when it does it leads to chronic inflammation, pain and the destruction of healthy cells and organs. The disease usually strikes women of childbearing age (nine out of ten patients with lupus are female). As a result, medical experts believe there is a hormonal component. Genes, environmental toxins and dietary factors are also thought to be at work. 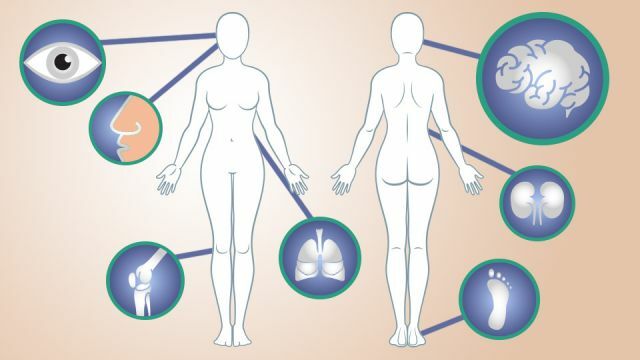 Lupus can manifest in many forms from mild to severe to life-threatening. In addition, sudden flare-ups can make the disease very hard to predict. If caught and treated early enough, then patients with lupus can expect to live a normal lifespan, but early diagnosis and intervention are imperative. For this reason, advocacy groups, like the Lupus Foundation of America, have launched a “Know Lupus” campaign. These symptoms are closely identical to set of criteria developed by the American College of Rheumatology, which are designed to help doctors diagnose lupus. According to their recommendations, having four or more of any of these symptoms at any one time is a “strong” indication that a person has lupus. What happens if I’m diagnosed with lupus? Lupus is not something that should go untreated because life-threatening flare-ups can occur at any time. However, as many as 50 percent of lupus patients will only experience mild (non-life threatening) symptoms such as headaches and chronic fatigue. In any event, medical practitioners insist that constant monitoring is essential to prevent a potentially fatal progression of the disease. In the past, the five-year survival rate for a person with lupus was just 50 percent, but that figure has increased to over 95 percent through the use of steroidal and antimalarial medications, which suppress immune overactivity. For milder case, doctors often prescribe non-steroidal anti-inflammatory drugs to manage pain and symptoms. Dixon adds that “Everyone has to figure out her own triggers” as well as what medications and foods can offer relief. This can be a trial and error processes that you undertake with your physician. The good news is that if you heed the warning signs and work closely with your doctor, then you stand a good chance of putting the disease in the back seat and living a full life. Hey Buddy!, I found this information for you: "Ladies: 15 Early Warning Signs Of Lupus You Shouldn’t Ignore". Here is the website link: https://www.thealternativedaily.com/15-early-warning-signs-of-lupus-you-shouldnt-ignore/. Thank you.